This weekend was spent visiting my family, at my parents’ new place east of Brockville. I packed up Raven and headed out on Friday, and then returned home late today. It was a tri-purpose gathering, combining a belated Mother’s Day with two birthdays (mine and my sister’s, which are two days apart, usually on Mother’s Day weekend). My entire immediate family was there, an uncommon event these days as we’re spread across nearly half of southern Ontario, with close to 450 km (280 miles) separating the two furthest people (the closest two are still an hour’s drive apart). It was a really nice weekend, full of family and good times, but I must admit that in four days I didn’t do a smidge of naturalizing. I barely did any birding, even; aside from about 15 minutes spent with the binoculars Saturday afternoon, my only birding was what I noticed singing or caught a glimpse of while wandering around. My camera spent the weekend in its bag. So my Monday Miscellany is on the short side this week. The first photo is from mid-week. 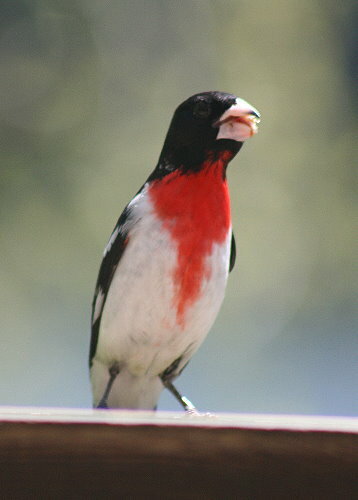 The Rose-breasted Grosbeaks, including this stunning male, have been making regular trips to the feeders. I’ve been seeing more of the females than the males, although the males can be heard regularly singing in the vicinity. They’re big fans of the sunflower seeds, so we’ve been continuing to fill our feeders even though the winter birds have all mostly departed. I always look forward to the return of these guys to the feeders in spring. 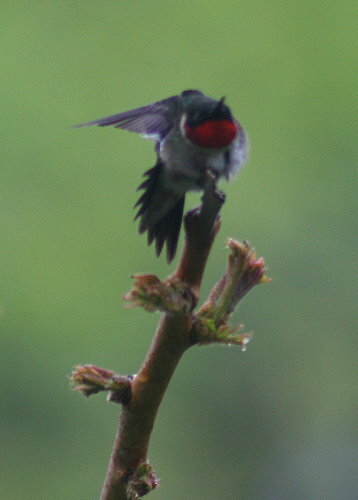 The Ruby-throated Hummingbirds have settled in to the area, I think. My mom had at least two females visiting her feeder, and I heard a male doing a U-display at one point. I have yet to see a female here, but then again, I was away all weekend. It astounds me how fast these little birds can beat their wings when flying (an average of 50 beats per second, but substantially higher in certain situations). Watching them hover in the air as they pause to scan their surroundings is like magic. They should be starting to nest soon; also magic? the amazingly tiny nests they build, and the even more amazingly tiny eggs they lay in them. On the particularly rainy day we had last week, I noticed this little guy sitting on the small sumac tree that’s near the feeders in front of our house. He would feed, then sit on the branch for a while, then return to feed, then back to the branch. I guess with the weather so cool and wet, he didn’t want to waste a lot of energy flying all over the place, so he stuck close to a guaranteed food source. On my birthday Dan and I went out in the afternoon to visit one of the MAPS sites. 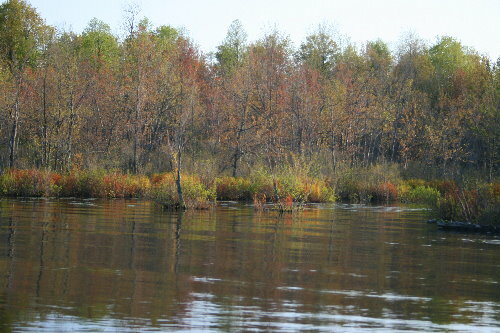 It’s the site we have to paddle in to, and at the launch point where we were putting the boat in to the water, I noticed a large patch of vibrantly coloured bushes. The area where they were growing seemed to be under water, and it was hard to tell if the plants were victims of higher-than-normal water levels, or if they were swamp or other wetland bushes. Their colours, and those of many of the small saplings growing among them, really reminded me of the autumn landscape. These could almost have gone in to the “Wings of the day” W week post. I’ve noticed both dragon- and damselflies to be becoming much more abundant recently. The above, a Springtime Darner (Basiaeschna janata), and below, a Common Baskettail (Epitheca cynosura), were both observed along a stretch of dirt road slightly to the north. They were flying along the edge of the road, in the low, open area between the hard-packed dirt and the forest. 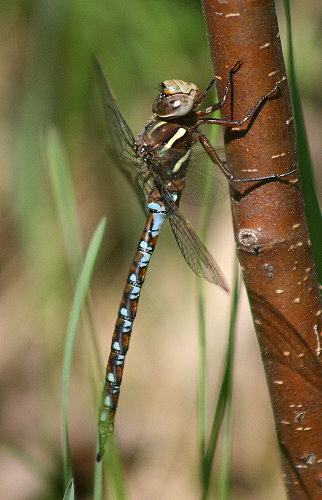 Many dragonflies are territorial, and will patrol up and down a stretch of road, path, forest or pond edge, or other open area, as they watch for intruders and look for females. Indeed, these two were doing just that, sweeping up and down the road and then periodically landing on a tree or twig to sun and “recharge”. Penblwydd Hapus! – as we say in Wales, UK. So glad you had a good birthday. 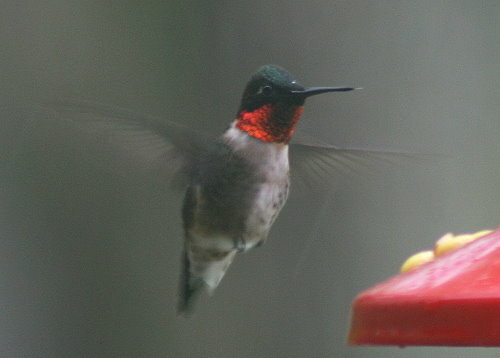 I particularly like the Ruby-throated Hummingbird. I always learn such a lot from your wonderful blog. I just saw my first grosbeaks of the season this weekend. The one in the photo above looks like he’s giving a speech. Happy belated Birthday. 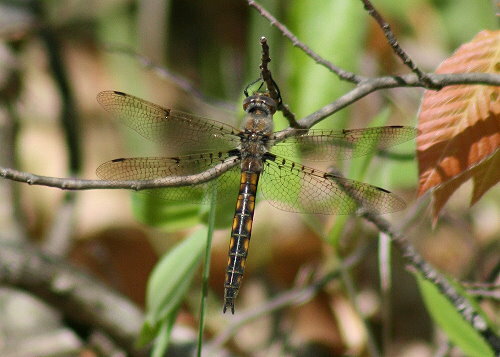 Nice photo of the Springtime Darner….I keep looking for these around our area.